Americans grow up expecting that in a time of need, their country can depend on its people for volunteer service to the military. Indeed, this has been a social and at times legal expectation for the citizenship of this country since 1776. Yet, since the end of World War II United States forces have been caught up in many long term military engagements, and the military aspect of citizenship has become an increasingly marginalized one in a world where only a minority of citizens even vote. 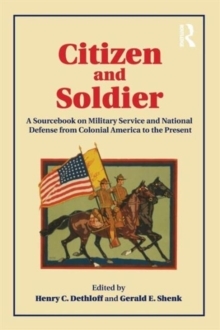 Citizen and Soldier: A Sourcebook on Military Service and National Defense from Colonial America to the Present provides a useful framework and supporting documentary evidence for an informed discussion of the development of the American ideal of the "Citizen Soldier". Presented with insightful introductions and useful discussion questions, this concise collection of 27 primary documents takes a close look at the United States military and shows how it became entwined with the rise of American national identity.